Maine Coast Waldorf School is participating in a worldwide postcard exchange initiative to both broaden the global perspective of students and kick-off the 100-year celebration of Waldorf® Education planned for 2019. Throughout 2018, students in 1,100 Waldorf schools from greater than 80 countries are sending a postcard to every other Waldorf school in the world. Each postcard has been individually designed by a young person, telling or showing something of his or her country, school, or self. At Maine Coast Waldorf School, the postcards were designed by the high school students. They used bees and flowers as their inspiration since Waldorf schools around the world are also taking up beekeeping and planting pollinator gardens as part of the 100th anniversary of Waldorf education. The students carved their original designs (20 in total) into a printmaking rubber and then printed out the 1400+ postcards over several months. The Class of 2021 took the lead on the project, but everyone in grades nine through twelve had their hand in the printing of the cards. 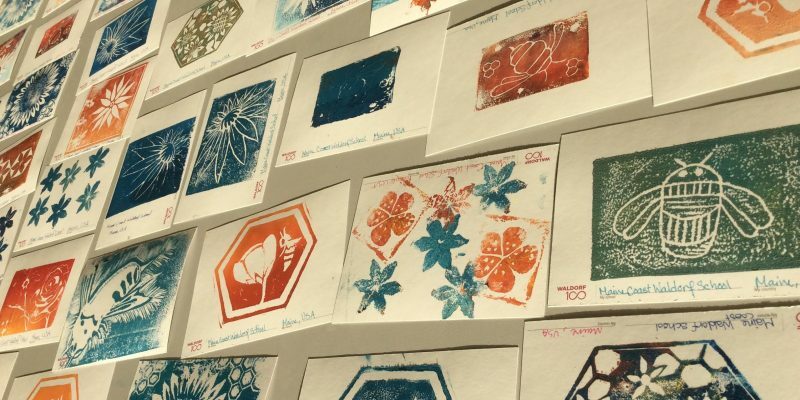 This innovative global project connects hundreds of thousands of students to one another through individualized and artistically designed postcards, which are then arranged by each school for public display. 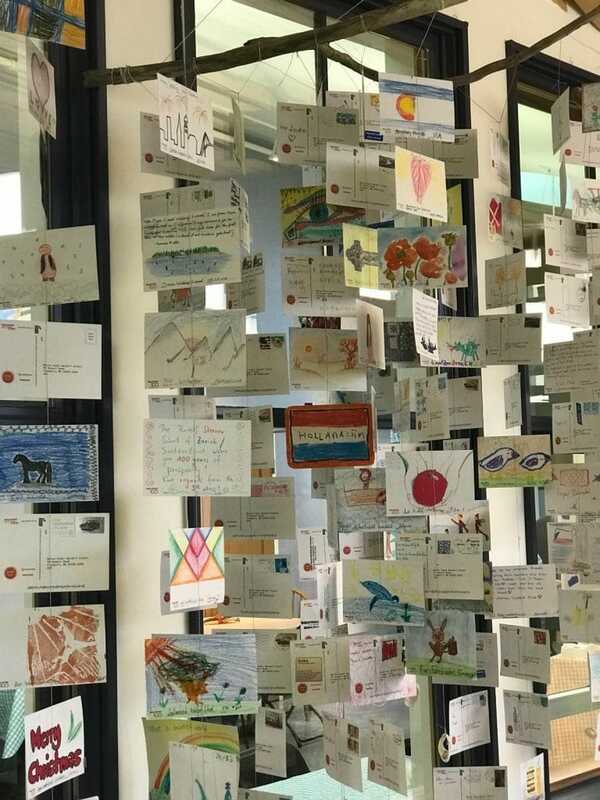 At Maine Coast Waldorf School, the high school students have taken the postcards received so far and hung them, making them into attractive mobiles so everyone can enjoy both sides of the cards and the interesting stamps from around the world. Maine Coast Waldorf School is delighted to be a part of this million-fold Waldorf greeting from around the globe!